Published on May 15, 2014 in General T&T, Media and Passed on. 11 Comments Tags: Baby Dies, Newsday. The mother of a 17-month-old boy is today standing by the child’s grandfather who forgot the baby in his car at work, on Tuesday, only to find him dead when he returned to the vehicle hours later. “A most wonderful grandfather, the best grandfather in the world,” is the praise Masika Wharwood had yesterday for her father-in-law who had her son, Jaedon Cudjoe, in his care and is inconsolable over his death. 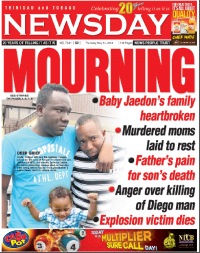 Winston Cudjoe, 56, had placed his grandson in a car-seat in the back seat of his Nissan Teana and left their home at Aquat Village, Penal to take the child to stay with a relative, before heading to work at a division of State-oil company, Petrotrin in Penal, on Tuesday morning. 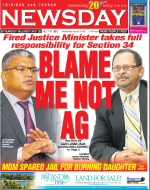 Published on May 15, 2014 in Gender, General T&T and Jamaica. 1 Comment Tags: Corey Gilkes, Male Entitlement. How nobody eh pick up on this one, jred? Or maybe someone did and I jes eh see it. So much things going on eh, I almost forget this gem of an article that came out in the Jamaican Gleaner on March 30th. I had to read it several times just to make sure the writer, one Milton Wray, wasn’t using irony – a dying skill in vocabulary of late I gather.